I spent two hours with Mr. Tom H. of Advanced Hearing Services, right here in Ramsey, N.J. yesterday afternoon, and at this point, I believe that we have success. Tom did an audiogram right up front and worked with the various Oticon programs to reprogram both of the new aids and he has basically eliminated the feedback in both the normal mode and in the telephone program. In addition, I believe that the volume wheel in the right aid and the phone button in the left aid are now functioning as Donna hand programmed them. Murray knows what a long journey this has been, as I went to see him in the latter months of last year after rejecting the aids of another Manufacturer. Murray suggested Oticon, and with the time, patience, and professionalism of each of you, I believe we now have achieved our goal of providing Bob G. with the ability to hear as close as possible to normal. It has taken time with numerous visits to Murray's office in Jupiter, FL. and a number of visits to Donna's location in Somerset, N.J. 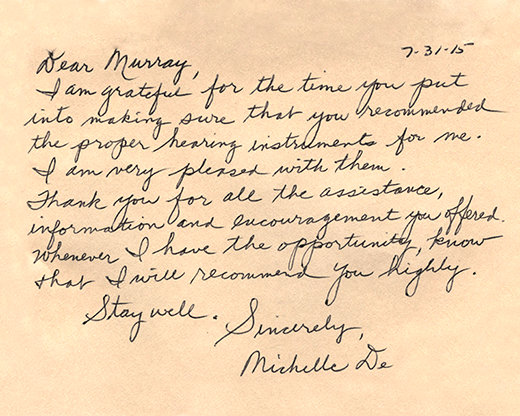 I'm retired, so I had the time, and I made up my mind that, after numerous purchases of hearing aids over the years, that I was going to find a company that could provide me with the best hearing available, and since I did not know what was available, I went to see Murray. 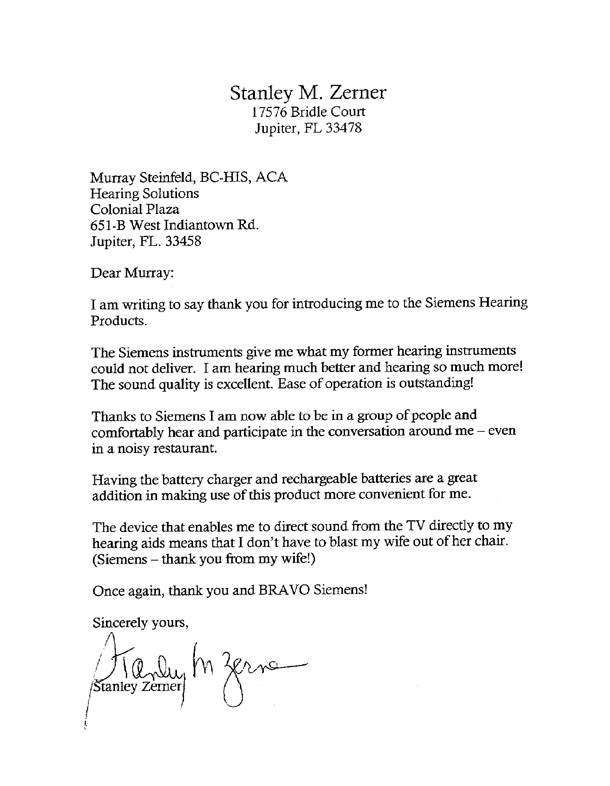 Murray, to me you are the most dedicated professional that I know in the industry, and I knew that you would not give up until you provided Bob G. with the best possible hearing available in today's market. And I now believe that you have succeeded. I just can't thank you enough. Donna, you have been a tremendous help to Murray and I, both on the phone and in person at your office. I believe that you work for a very fine company, and you and your company, Oticon, have certainly provided me with the highest degree of understanding and service. And so, I will close by once again thanking you both for your time." 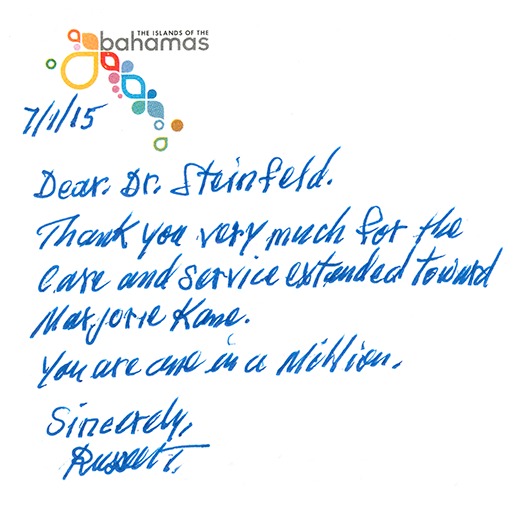 "Dear Mr. Steinfeld, I just wanted to confirm that my dad, Aaron Fisher, has an appt with you on 11/9/09 at 11:00. I was just in FL from 10/21-25 for his 93 birthday, which was on 10/19. He seems to be hearing and understanding very well, even the long convoluted stories that females like me seem to tell. In the house, in quiet, I can be behind him several feet; or in back of his right side, the non-aided side, with the TV on, and he hears me just fine. Before, without the new hearing instrument, he said that the guys didn't talk while playing poker. Now, he said that they have lively conversations while playing cards. He did fine at Ke'e Grill when it was just him and me and the restaurant was not that crowded. My nephew said that he had more difficulty at a more crowded restaurant with a group of 5, which I understand, because I have the same problem, having a unilateral hearing loss in my right ear. He's talking and answering the phone fine. He does fine just holding the phone ear piece away from his ear a little bit. Thanks so much for finding a good hearing aid for him. He seems to be doing well with it. Also, thanks so much for being sooo kind to him. He has enjoyed your conversations about Paterson, etc. That's really made all the difference for him accepting the new hearing instrument and coming for visits." - Sherry Laten, M.S.W., Ph.D.
"We can't thank you enough for Brandon's ear protection. That was just an amazing gift you gave him before he left for Iraq and he greatly apprecates it. He probably doesn't fully understand its value yet. "This is a note of thanks for your kindness when I visited your office seeking repar of my heairng aids, which i purchased in New Jersey. I was very grateful for your kindness and your "state of the art" knowledge of the hearing instrument sciences, I know understanding so much more about my hearing aids, e.g. you instructed me in not having to remove it when using the telelphone, 'a great benefit'! Since your repair, my aids are doing great!! They fit better and transmit sound much more clearly. You have my admiration and respect for your goodness and kindness." "I am an airline captain from a major carrier, I flew until my retirement at 60 years old. Towards the end of my career I began to notice some loss of hearing. It was never severe enough to be a problem. I spent thirty some odd years flying and in the early days we never realized the danger to our hearing. Engine noise, ramp noise and scrub noise from air moving by the cockpit at high speeds all contributed to hearing damage. A couple of years after retirement I started having dizzy spells. This turnded out to be Meneres Syndrome. (I think I spelled that right). I was given three choices. The first was to kill the nerves in the ear. The second was to take medication the rest of my life. The third was an operation to remove part of the mastoid bone and relieve the pressure on the inner ear. I elected the last. After the operation I was nearly deaf in that ear. Much testing proved the hearing loss to be 80%. There was no hearing aid at that time that would do me any good. As I had full hearing in my other ear, I learned to live with it. I never got over how awkward it was to have no sense of direction from which sound was coming. Equally awkward was having to turn my one good ear to whoever I was engaging in conversation. I decided there had to be something somewhere that could help. After visiting many hearing aid offices I stopped into your office on a whim just to see what might be available in the few years since my operation. After spending some time talking with you, we decided to test my hearing. You spent a couple of hours on a battery of tests. The result was I said, 80% loss in my left ear and nearly normal in my right ear. It was your contention that there was computerized technology that could be programed to my loss and give me back the balanced hearing I had before the surgery. Although skeptical and in spite of the expense, I decided I had no choice if I ever wanted to hear using that ear again. I ordered it hoping I wasn't buying a great story from a very glib medicine man versed in the glories of mystical snake oil. I need not have worried. A few weeks later I showed up at your office to see your smiling face. You explained the do's and don'ts and we proceeded to put it all in place. I'm not sure what I expected but whatever it was exceeded my wildest dreams. It was like a gift from G-D. All of a sudden I could hear again! I could hear from any direction fro the first time in years. I was near tears. I don't want to do any play on words, but it truly was like a miracle. Its' been a couple of months now and the ear and I have become great friends. I've thought about all the ways I could say "Thank You" for the use of the ear and yourself and I can only say that I think of you as a friend. You said it could be done and I believed you. You were so right! Let me do it this way ..........THANK YOU!!!!!! Now if this darn thing just keeps doing it's job, I'll be a very happy man."